AutoCAD includes a very acceptable PDF printer driver, and both PDF and DWF are suitable candidates for external reference attachments. The Adobe PDF format has been around for a very long time, and for a while, it seemed like Autodesk was trying to supplant it with its own universal file format: DWF (Design web Format). That didn’t happen, but if you can’t beat ’em. If the External References palette isn’t already open, click its icon on the Palettes panel of the View tab to open it. Use the toolbar at the top of the palette to attach an external file as an xref, a raster image file, or a DGN or DWF underlay. See the online help for information on attaching DGN files. Click Attach DWF or Attach PDF and then locate the file you want to attach. 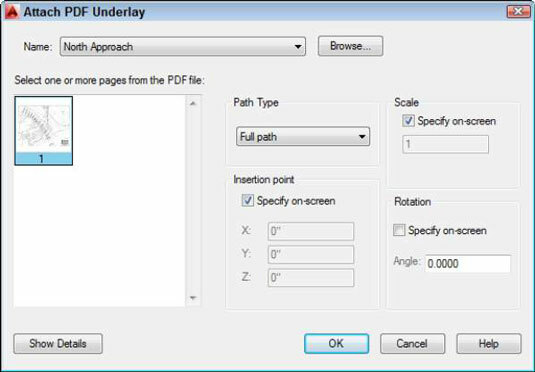 The Attach DWF Underlay or the Attach PDF Underlay dialog box appears. Specify the parameters for the DWF or the PDF in the dialog box. Parameters include specifying a sheet, the insertion point, scaling factors, rotation angle, and path type. You can set these parameters in the dialog box or specify them onscreen, just like you can do when inserting a block, attaching an xref, or attaching an image. The externally referenced DWF or PDF file appears in your drawing.